Microsoft has clarified the licensing for retail versions of its Office 2013 productivity suite, confirming that boxed editions of the software are licensed for a single PC only and that the license may never be transferred, even if the user upgrades to a new PC. You may not transfer the software to another computer or user. You may transfer the software directly to a third party only as installed on the licensed computer, with the Certificate of Authenticity label and this agreement. Before the transfer, that party must agree that this agreement applies to the transfer and use of the software. You may not retain any copies. Note the italicized portion above (emphasis ours). What it means is that the only way to give or sell your copy of Office 2013 to someone else is to physically give it to them, by handing over the actual computer that the software is installed on. Under these terms, you can't even transfer the software to yourself. If you buy a new PC, you're expected to buy a brand-new retail copy of Office to go with it, even if you uninstall it from your old machine. That Microsoft would be so brazen as to license its software under such terms beggars belief. And yet, as it turns out, that's just what it has done. 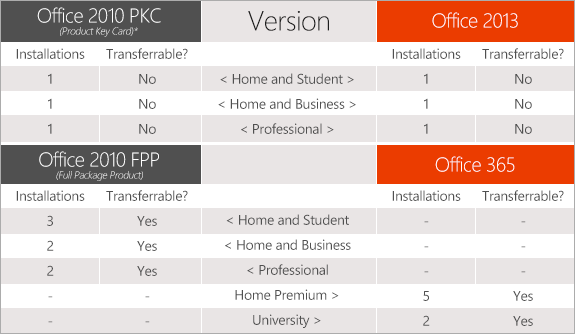 In a blog post on Tuesday, Redmond rep Jevon Fark laid out the licensing models for the various editions of Office 2013 in a helpful table demonstrating how they compare to the equivalent editions of Office 2010 and Office 365. Sure enough, while the packaged retail editions of Office 2010 were licensed for installation on up to two computers (or three, in the case of the Home and Student Edition) and the licenses were transferrable, Fark's chart confirms that neither is true of the retail Office 2013 editions. Furthermore, Fark explains that this isn't the first time Microsoft has issued such a license. In fact, the same terms were included in the license for the Product Key Card (PKC) editions of Office 2010 – the little cards that were sold at retail but included only a Product Key and no install media. According to Fark – the Microsoft staffer, and not the website of the same name – the PKC editions were "chosen by a majority of Office 2010 customers worldwide." It seems unlikely, however, that many of them took the license terms into consideration when they did so. Just how enforceable such a license may be is open to question. Legal precedent varies depending on the jurisdiction, with European courts tending to lean in favor of consumer rights. But in the US, at least, it seems likely that Microsoft's language would be upheld by the courts as legally binding. We do not sell our software or your copy of it – we only license it. Under our license we grant you the right to install and run that one copy on one computer (the licensed computer) for use by one person at a time, but only if you comply with all the terms of this agreement. Our software license is permanently assigned to the licensed computer. Fark says the only exception to the non-transferability clause is if a customer's PC fails while still under its warranty period. In that case, he explains, "the customer can contact support to receive an exemption to activate the Office 2013 software on the replacement PC." Perhaps you would prefer a subscription? So what are honest customers to do if they need to use Office on more than one computer, or if they plan to buy new PCs before the next version of Office comes out? Anyone who has been following the latest Office launch should already know Redmond's answer to that: those customers should skip the retail version of Office 2013 and get Office 365 subscriptions instead. As Fark points out, each Office 365 Home Premium subscription allows you to install the Office applications on five different computers at once, and the licenses are infinitely transferable – just deactivate the suite on one device and install it on another. Details for the business editions of the new Office 365 have yet to be formally announced, but El Reg has it on good authority that those licenses will allow similar flexibility. Still, not every customer will be pleased with an arrangement under which they essentially rent their software, rather than buying it, and many are sure to resent what seems like a strong-arm tactic on the part of Microsoft designed to break traditional purchasing patterns. Stricter licensing for the retail versions of Office isn't the only way Redmond has been trying to push customers toward the subscription model, either. Early on it tried the carrot approach, by offering various incentives as exclusives for Office 365 customers. Lately, however, it has increasingly favored the stick – most recently by upping the prices of the Mac version of Office to match those of its Windows counterpart, even though Office for OS X has not had a refresh since October 2010.